Bodyhacking: The next frontier in cybercrime. If you think it’s enough of a chore trying to stop thieves stealing your credit card details and hacking your Facebook, imagine trying to stop them getting into your pancreas. Advances in health care mean that in-body devices to treat chronic conditions or even just make you perform better as a human being are not as far away as you might imagine. Some of these innovations already exist. The pacemaker has been around for years, and drug delivery implants are already quite advanced. Some are controlled remotely and many more will be in the future, significantly raising the stakes in the battle to protect ourselves from cybercrime. 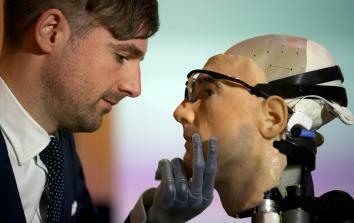 Researcher Bertolt Meyer uses his bionic hand while examining a humanoid robot. When TV series Homeland featured a storyline in which terrorists hacked the vice president’s pacemaker, causing him to have a heart attack, it brought this issue into the public consciousness. But the scenario has been possible for some time, says Sadie Creese, Director of the Global Centre for Cyber Security Capacity at the Oxford Martin School, University of Oxford, and more people will be vulnerable in the future. Demonstrating this future phenomenon in action during FutureFest, social psychologist Bertolt Meyer allowed a fellow speaker to control his bionic hand using an iPhone app connected via Bluetooth. “My hand comes with an iPhone app. There is an app for that. This gives the word hacking an entirely new dimension because if someone hacked my phone they could hack my hand. There’s a trickle-down effect of things we are able to do,” he said. While many people won’t have to worry about having their limbs controlled remotely like Meyer, in-body devices are not as far away as we might imagine. Meyer noted that it is already possible to hack into delivery systems for diabetics, meaning that criminals could remotely deliver fatal doses of insulin. As devices like bionic arms become more advanced, it is not inconceivable that people might choose to replace functioning body parts with high-performance models. Meyer’s state-of-art hand can rotate a full 360 degrees. How many of us can say that? Add to this a number of people who will choose to have voluntary surgery or have devices implanted in order to improve their basic health or appearance, and the implications are even more serious. “The truth of the matter is, it’s kind of already here but mainly for significant conditions. Give it five to ten years and we’ll all be wandering around with devices,” adds Creese. Creese believes the general public needs to start engaging with the debate about their information now rather than leaving it until the technology develops further. Even before we start taking technology into our bodies, cybersecurity threats are changing all the time and individuals are implicated more than ever. While attacks on major companies have been the big prize for criminals and hackers until now, targeting individual consumers is becoming almost as financially lucrative. Now that organized crime outfits have come to embrace cyber-attacks as a tool, the threat is more real than ever. For Creese, it seems people will only start to take these issues seriously when they personally suffer the consequences. “I think that the real change and the real concern will come from the general population when more people start to feel pain,” she said.